The Super Bowl is over, all eight (!) head coaching vacancies have been filled and we can, at long last, close the book on the 2018 season. And while it may seem like an eternity before next season with a draft, free agency and more in between, we can at least start looking at which fantasy football options will be most affected by their new play-callers. Below is a look at the winners and losers of each team thanks to their new head coaches. Winner: Any receiver. There are a lot of reasons to be excited about Cardinal receivers Larry Fitzgerald, Christian Kirk, and whomever else they bring in. 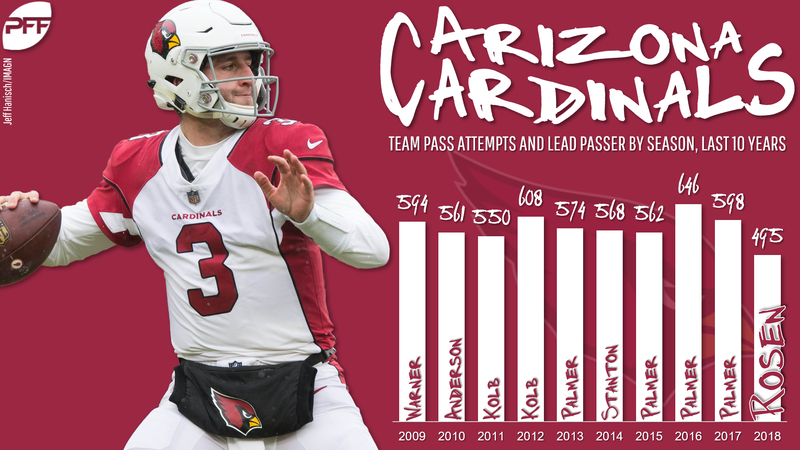 For example, the Cardinals should be passing more (hence the reason to bring in Kingsbury) after averaging only 30.9 pass attempts last year. That’s a far cry from the 37.9 pass attempts they averaged the previous three seasons. Additionally, the quarterback play almost literally can’t get any worse than last season as rookie Josh Rosen finished 36th out of 37 quarterbacks with at least 200 dropbacks in PFF grades. Loser: Any tight end. With the exception of his first year in Lubbock, Kingsbury has yet to have a tight end play an even minimal role in his offenses. No tight end in the last five seasons of Kingsbury’s Tech tenure recorded more than 20 receptions or finished in the top five in targets on the team. Winner: Joe Mixon. Mixon was already one of the league leaders in rush attempts with 237, good for eighth last season. The hiring of Taylor should continue that trend. In the same two seasons Taylor worked on Sean McVay’s offense, the Rams didn’t have a second running back record more than 63 carries. And if we can glean any lessons from a team bringing on a McVay disciple, it would be Tennessee last year when they hired Matt LaFleur to be their offensive coordinator. Following the Rams’ lead, the Titans ran the ball a lot, finishing ninth in rush attempts after ranking 12th the previous season. This resulted in them moving up to sixth in rushing yards after finishing ninth in 2017. Loser: Bengals tight ends. No matter if it’s the Rams or Titans, a McVay-inspired offense has yet to make the tight end a significant factor in the offense. The Rams’ tight ends in 2018 ranked just sixth and seventh, on their own team, in targets this season. It was a little better under LaFleur in Tennessee where tight ends ranked fifth and sixth in targets. Winner: The sophomores. 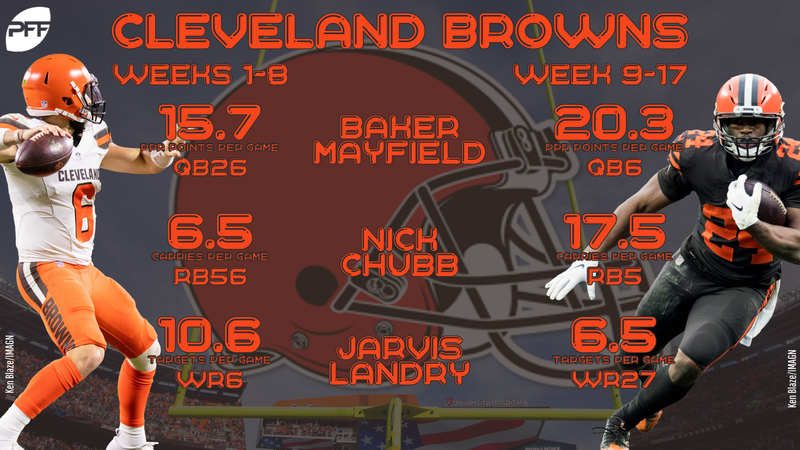 Baker Mayfield and Nick Chubb were drafted in the first and second rounds, respectively, of 2018 to lead the Browns offense for years to come. Halfway through the season, after Kitchens was tapped to start calling the plays, it appeared the Browns got it right. Mayfield recorded six games of multiple touchdowns passes in his last eight, while Chubb recorded three 100-yard games in his last eight with seven total scores. Loser: Jarvis Landry. While it may have seemed to be all rainbows and unicorns for the Browns offense after Kitchens stepped in, there was a clear loser in Landry. Brought in from Miami to replicate his target-hog style, he initially saw double-digit targets in every game but one before the coaching change, while ranking third in total targets through the first half of the season. He never saw double-digit targets again after that and ranked just 26th over the last eight games of the season. Winner: Philip Lindsay and Royce Freeman. Scangarello has followed 49ers head coach Kyle Shanahan around including Atlanta and San Francisco and, in both stops, the offenses produced fantasy-relevant running backs. Whether it was Devonta Freeman in Atlanta as a top-five running back; Carlos Hyde in his lone year with Shanahan in San Francisco, when he finished as a low-end RB1; Matt Breida last year, who still finished as an RB2 despite missing three games; to even Tevin Coleman in Atlanta, who finished as an RB2 the same year Freeman was in the top five. Loser: Case Keenum. With Denver turning the page on head coach Vance Joseph, Keenum lost his best chance at keeping the starting job. With a new coach, offensive coordinator, et al, it’s clear that part of the strategy is to hit the reset button on the offense and that includes a new quarterback. And it looks like Keenum’s 2017 breakout season might have just been a fluke, as it’s the only season he has topped 7.0 yards per attempt or completed more than 63% of his passes. Winner: Aaron Jones. Whether it was the Rams two seasons ago or the Titans this past season, both offenses with LaFleur as the coordinator were top-10 in rush attempts and rushing yards. This bodes well for whoever the starting running back is for Green Bay. That has been a fluid situation the last few years, but that shouldn’t be the case this year with Jones returning. He’s averaged 5.5 yards per carry over his two-year career, which has included 200-plus carries, and was 14th in PFF’s elusive rating last year, forcing 33 missed tackles on just 159 touches. Loser: Jimmy Graham. Any hope Graham would bounce back in 2019 might have gone out the window when LaFleur was hired. LaFleur just doesn’t use them in the passing game, having not had a tight end finish in the top-four in targets in either of his two seasons as a quarterback coach or coordinator. In fact, over those two seasons — 2017 in LA, 2018 in Tennessee — tight ends cumulatively averaged 74 targets, 48 receptions for 594 yards, and five scores. By comparison, 74 targets would be Graham’s lowest since his rookie season. Winner: Dolphins slot receivers. It’s rare for a head coach with no head coach experience to bring on an offensive coordinator with no offensive coordinator experience, but here we are. O’Shea, like Flores, comes from New England, where he was the wide receivers coach for 10 years. And if you need a reminder on how wide receivers have fared in New England, look new further than last Sunday’s Super Bowl, when Julian Edelman lit up the Rams and somewhat ludicrously entered the Hall of Fame discussion after not playing the position until he got to the NFL. Of course, Edelman follows fellow Patriots slot receiver (and former Dolphin!) Wes Welker, who owns three of the top-15 seasons when it comes to receptions. Both Welker and Edelman were coached by O’Shea, who will now work with the likes of Danny Amendola and Albert Wilson in the slot. Loser: Dolphins running backs. We don’t have direct history to go off of, but if former Patriots coaches Flores and O’Shea implement the New England way, get ready for running back rotation that just won’t be reliable from game-to-game or, for you dynasty owners, year-to-year. In the 10 seasons O’Shea was a coach with the Patriots, the Patriots had seven running backs lead the team in rushing. And as any fantasy player knows, it’s hell trying to predict which New England running back will be the flavor of the week. Winner: Sam Darnold. It was a struggle to find an actual winner out of the hiring of Gase. After all, outside of his two-year dalliance with Peyton Manning in Denver during the 2013-14 seasons, Gase hasn’t led an offense that’s finished in the top half of either yards or points. However, that’s still better than the resume of Darnold’s offensive coordinator in 2018, Jeremy Bates. In his two years as an offensive coordinator — 2010 in Seattle, 2018 in New York — a Bates-led offense failed to finish better than 28th in yards or 23rd in points. Gase, at least, has a track record of being involved with successful offenses, whether it was him or Manning calling the actual shots in Denver. Loser: Jets running backs. Fantasy players may recall the extremely frustrating running game in Miami last season. We were all set for a breakout season from Kenyan Drake after previous sensation Jay Ajayi was sent packing. Yet, Frank Gore was brought in and ended up leading the Dolphins in carries. That’s not even the worst part, as neither Gore nor Drake could be relied on to see a majority of carries from week-to-week. That’s not new for Gase, who has had exactly three seasons of a running back averaging more than 15 carries per game. Winner: Jameis Winston. Fixing Winston was the biggest reason Arians was brought in. 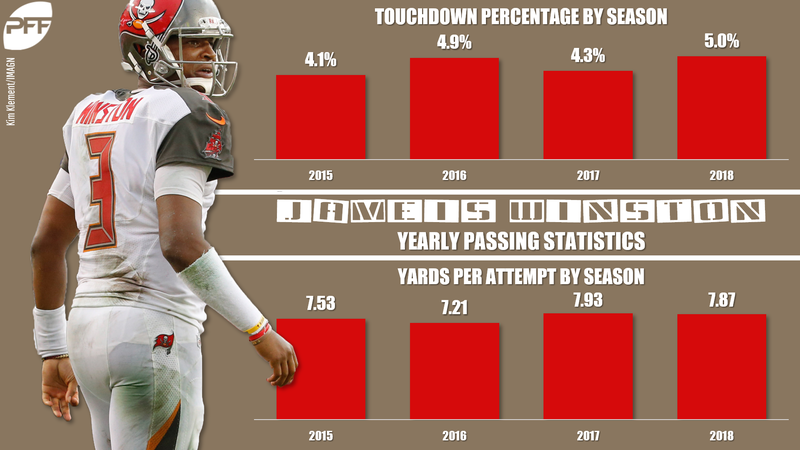 It certainly looked needed as, at least on the surface, appeared that Winston had been in decline since his sophomore season, when he threw for over 4,000 yards and 28 touchdowns. However, it’s actually been injuries and suspensions that look to have held Winston back more than anything. He missed three games in 2017 and five more in 2018, yet his yards per attempt were 7.9 in both seasons, a career-high. He also would have tied for his career-high in touchdowns passes last year if you extrapolated what he did over the 11 games he did play (19). If he can stay healthy, he’ll be in great hands. Just how great? As a head coach or coordinator, Arians’ offenses as either a coordinator or head coach have finished in the top half of the league in passing yards the last 10 years while he’s produced a top-three ranking in touchdown passes at every stop he’s ever had, save for his lone season in Indy when they finished seventh. Loser: O.J. Howard and Cameron Brate. Even before the hiring of Arians, it was fair to wonder if the Bucs would cut Brate. After all, you probably don’t need to spend $7 million on your backup tight end. But for Howard, despite his talent, his role could also be up for grabs. Across Arians’ five-year tenure in Arizona, his top tight end averaged only 50 targets, 32 receptions, and 348 yards per season and were often fourth or fifth on the offense in targets. With a receiving corps of Mike Evans, Chris Godwin, and (for now) DeSean Jackson, Howard may draw the short straw.